Only Microwave penetrates the cutaneous and fatty layers unimpeded. The High Frequency Electromagnetic is converted into heat only when it reaches the lower lying water containing tissue, hence at the critical site. 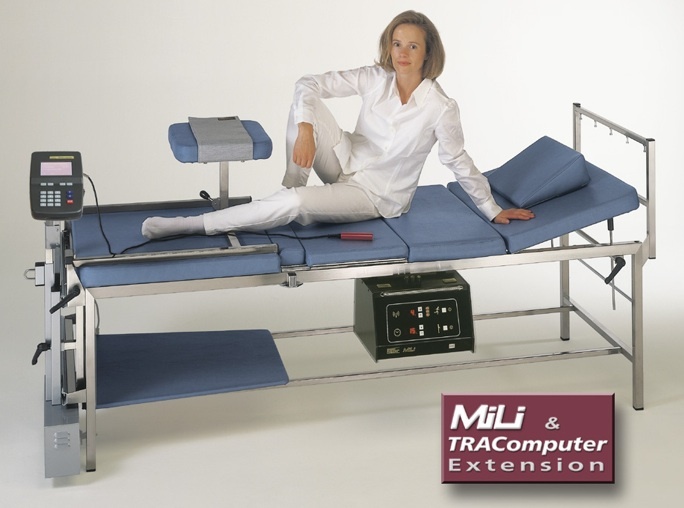 Medizin make Microwave Diathermy – MiLi slides under a Couch and has High Frequency output of 250W, 1700W Pulse. Microwave are radiated through three slits. No additional emitters are required. Microwave can be given simultaneously along with Traction Therapy. Microwave helps to relax the muscles & tissue; and traction becomes more beneficial. The benefits of Traction Therapy, especially of Cervical and Lumber, have been known in Physical Medicine for a long time. Easing of the foraminal and disc pressure additionally results in relief of the irritated nerves. The main field of use is Lumber and Cervical Traction, but traction of other joints like Hip, Thoracal, Shoulder & Knee is very effective and entirely possible. Medizin TRAComputer apparatus requires little space since it is partly integrated underneath the couch. TRAComputer allows any type of Traction force - Static, Intermittent or Pulse. Additionally, the couch features a sliding section that eliminates any frictional error. Both Microwave Diathermy & Traction can be given simultaneously to a patient while comfortably lying on the couch. Before starting Traction for relaxing the patient Microwave Diathermy Corresponding to 125 Watts for at least 5 Minutes is recommended. Cumulative beneficial effect is achieved by Combining Traction Therapy and Microwave Diathermy. Combination Therapy results in faster recovery of patients. Copyright 2009 M W Enterprises. All rights reserved.